All over the world, road, rail, sea and air transport lanes are under pressure to handle increasing traffic volumes. We have in previous blogs reviewed various aspects of the challenge at sea (Maritime network connectivity – all at sea? ), and in public transport (SD-WAN handles fleet management and passenger services). Better road traffic management can alleviate traffic jams, but will entail a huge increase in WAN traffic volumes. Software Defined Network (SDN) and Network Function Virtualisation (NFV) technologies are emerging to handle the surge in data volumes on the WAN. The software-centric approach redefines the core WAN architecture, enabling it to adapt to fluctuating and complex network traffic patterns, and the ever-growing demand for mobile comms. Mobile access will use a wide range of network services: via satellites, multiple cellular mobile services, Wi-Fi, Bluetooth and right down to close-range, Low Power Wide Area (LPWA) communication for Internet-of-Things (IoT) services. 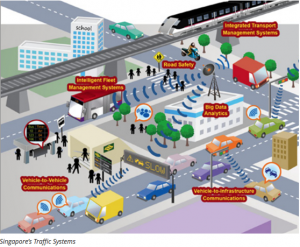 The autonomous car will need to intelligently access several of these channels simultaneously. That requires intelligent mobile SD-WAN access technologies from vendors like Peplink and CradlePoint (see update and correction at the end og this blog!) that can bond available access channels to handle the wide range of connections from IoT traffic bursts to huge terabit file transfers. Real-time traffic management relies on sensors feeding data to algorithms that identify where congestion is likely to occur (e.g. at traffic lights and in lanes) and what alleviating measures may be undertaken to minimise them. Airborne topographical aerial surveillance to monitor ad-hoc hotspots such as accidents and emergencies. Drones of course have many other functions than aerial traffic management monitoring. This can range from NASA’s planetary rovers for the Mars environment, to high precision agricultural Unmanned Aerial Vehicles (UAVs). In the latter case farmers are using what was once military aviation technology to grow better crops using sensors and robotics to bring big data to precision agriculture. Amazon recently announced successful trials of its centrally managed Prime Air drone delivery service in Cambridge, UK. The drone successfully delivered a TV streaming stick and bag of popcorn to the garden of a nearby customer! However, if this scales up, it will directly impact a lot of package delivery services. The automotive changes we are witnessing today all point to a steep rise in mobile communication needs that can adapt to changing signal availability be it cellular, Wi-Fi or emerging IoT communication standards. That will require intelligent SD-WAN devices to optimise access to and use of multiple network services. A reader points out that Cradlepoint does in fact not provide bonding capabilities in its SD-WAN router units. The Cradlepoint COR IBR600 router only detects network failures and seamlessly switches over to another active connected data source. I agree that this is not full bonding, merely failover. Mobile bonding, defined as the ability to aggregate bandwidth of all available wireless WAN connections, allowing the router to conduct a session over more than one connection simultaneously, comes from a few of the SD-WAN router vendors. Besides Peplink with its MAX On-The-Go multichannel router, these vendors include Viprinet with its multichannel VPN router, the Mushroom Networks Portabella, and arguably also Icomera which provides mobile connection services for buses and trains that aggregate parallel data networks.